Tesla Touch 150w TC Box Mod Review - Daily Vaping Deals & The Best Vape Product Reviews at Vaping Cheap! 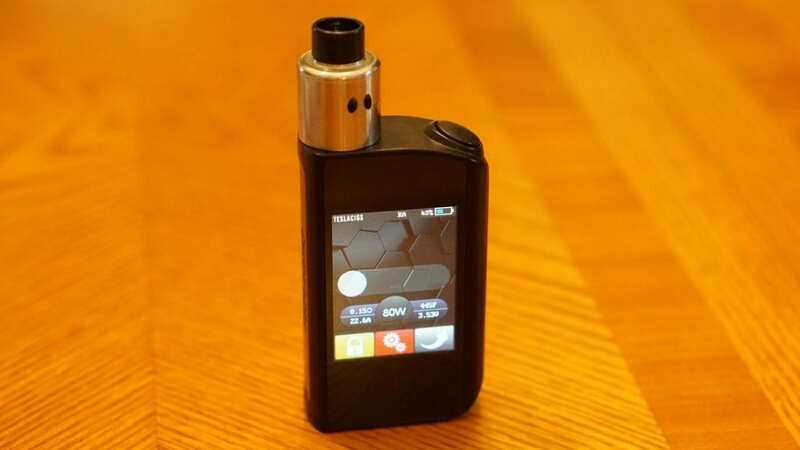 Touch screen box mods have always been something that many vapers have been interested in. There have been quite a few that have been released throughout this year, but some have not been received well due to some major downfalls. However, with technology in vaping advancing at a rapid rate, it can only be been seen that it will only improve over time. 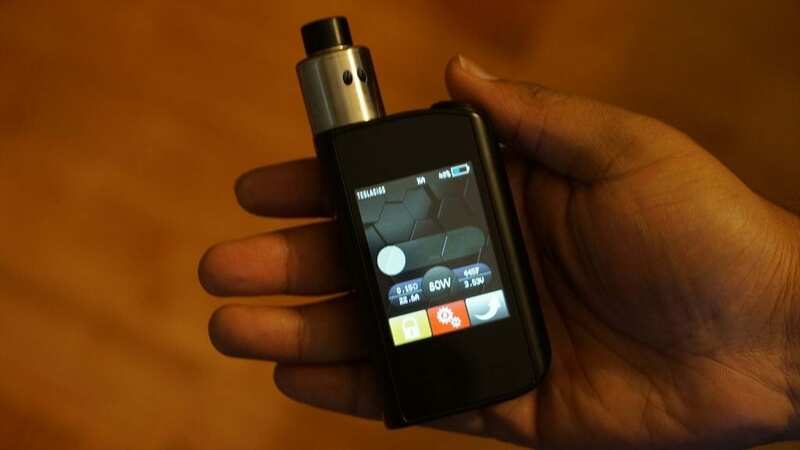 Even though a touch screen box mod is not something every vaper wants, there is still some interest with vapers who either want something different or like the idea of having a touchscreen to control their settings. With that being said, Tesla has released their own, the Tesla Touch 150w TC Box Mod. Firstly, I would like to thank Gearbest for sending this device my way for the purposes of this review. I will tell you exactly what I like and don’t like about this device, and conclude with telling you whether or not I recommend it! Click Here to Check Out the Tesla Touch 150w TC Box Mod! Use Coupon Code Tesla150W to receive a discount! When I first received the packaging, I did notice the really nice packaging this device came it. It just looks great, and gave the important information right away, which is the fact that this device has a 2.4 inch IPS touch screen display. In addition, on the back of the packaging it gave some other information, which I will go over in the product features. As you open the packaging, you see the Tesla Touch 150w TC Box Mod. The first thing I noticed about this device was that it looked great. It wasn’t too big or too small, just the perfect size in my opinion. Also, I did notice that the fire button is on the top of the device, which may be a con for some. Since most of my devices have the fire button on the side, I already knew this is something I would have to get used to. You also get a screen protector, which is definitely a nice addition. I know many people who love to take good care of their mods, so this was certainly a pro. In addition, you do receive a micro USB cable for upgrading the firmware and a user manual. When first holding the device, it just felt comfortable to hold right away. This device is certainly ergonomic, and I was a fan of the design right away. However, one of the first things that came to my mind was how will the touch screen actually work and hold up. This is something I will get into later on into the review. In addition, when I checked out the battery cover, the magnets were pretty strong. It had no play to it whatsoever, which was another pro. Not to mention, this device does require 2 high drain 18650 batteries, which is not included. Another thing I noticed was that on the bottom of the device it states that the micro USB port is for updates only and not for charging. I personally charge my batteries externally, so to me this was not an issue. I do want to mention that I always recommend charging your batteries with an external battery charger as this is best and safest way to do so. Since this device is firmware upgradeable, you will always be up to date with it, which is another huge pro. Another thing I want to mention is that there is literally zero rattle with this device. Honestly, the quality of the Tesla Touch 150w TC Box Mod is truly outstanding. All in all, my first impression of this device was all positive! The build quality was solid, and it just comfortable to hold right away. In the next section, I will go over my experiences with using this device over time. The first thing people would probably want to know how does the touch screen works? I can honestly say near flawless! I was surprised by how smooth the touch screen was, and it actually worked quite well. I know some other touch screen box mods in the past did not hold up well due to its design, or just simply not being a good device. Well, this device is certainly different, and I was certainly impressed with the touch screen. The screen is nice and bright, and you can adjust how bright you want it as well. The screen honestly just look good. It is extremely easy to navigate through the menu system. One simple swipe will unlock the device. Then one touch for the settings which will take you a list which has material set, TCR, lock vaping, resistant lock, speed mode and memory. Another touch will take you to the next list which has screen brightness, screen sleep, wallpaper, language, about and software update. This device does come with a few pre-installed wallpapers, but honestly I stuck with the one that was already set since I thought it looked just fine. What is a very nice feature is that as soon as you hit the fire button it locks the screen, so if you accidentally touch the screen it will not change anything. Also, you can easily change the wattage quickly by just touching the wattage, and clicking left or right for wattage up or down. Not to mention, on the main screen it shows valuable information such as resistance, amps, degrees (even in wattage mode), volts and your wattage right in the center. The overall layout of the touch screen is just perfect in my opinion, it gives you all the necessary information without being too confusing or over the top. Even though I have only mentioned all pros in regarding the touch screen, there were times where it was not as responsive, and would not register when I would touch something on the screen. This did not happen very often, but since it did happen I still have to mention it. Other than that happening once in awhile, the touch screen worked perfectly fine. The battery door is also very solid, and stays into place firmly. Not to mention, the battery tray never ripped my battery wrappings. Also, it is extremely easy to take your batteries out and putting them in. To me, this was certainly a huge pro, as I do hate when a battery tray rips your battery wrappings. Like said before in the first impressions, this device is ergonomic. It really is comfortable to hold for a long period of time, and I never once felt that this device was uncomfortable. This device is not small by any means nor is it large. To me, it’s a great size for pretty much anyone. However, if you are looking for something compact, this device may not be for you. Not to mention, the firing button placement was something I did have to get used to. Like said previously, most of the devices I currently own and use often have the firing button located at the side; hence is why I had to get used to it. Even though it was something to get used to, I got used to it rather quickly. In addition, I actually started to enjoy using this fire button, and found it comfortable to use after some time. What is definitely a huge pro to this device is that atomizers up to 24mm have no overhang! Atomizers with 25mm does have a slight overhang, but honestly it’s hardly noticeable. With many newer atomizers being 24mm and up in diameter, I’m glad it’s able to fit these atomizers with no overhang. Not to mention, smaller diameter atomizers look great on this device! Also, all of my atomizers sat flush with no gap at all, even atomizers with very long 510 pins. This is definitely another pro, as many vapers hate when they have a gap with their atomizers. All in all, using the Tesla Touch 150w TC Box Mod was a pleasure! The touch screen worked well, and it was extremely comfortable to use! In the next section, I will go over the performance of this device. This device has a maximum wattage output of 150w, and requires 2 high drain 18650 batteries. Honestly, this device vapes pretty accurately in comparison to a DNA200 device. However, I would say that it just feel slightly underpowered, and really it’s not noticeable. I do not typically vape over 100w, but when I did use this device at higher wattages it had no issues delivering the power! Not to mention, there are different power modes you can use, similar to that of a ramp up feature, which is certainly handy for exotic wire builds such as Clapton coils and Alien coils. The three different output modes are soft, standard and powerful. Also, the minimum firing resistance of this device in normal wattage mode is 0.1 ohm, and it fired a build with this resistance with no issues. In temperature control mode, the minimum firing resistance is 0.05 ohm. I did not have a build that low of a resistance, but it did fire a TC build that had a resistance of 0.09 ohm. I do want to mention that when your battery is drained, it does give a low battery warning at higher wattages. This would only happen when you are vaping above 70w, and your battery life is under 15 percent. At 15 percent your battery is drained quite low, around 3.4v, so I would not recommend vaping this device down to this battery percentage. Not to mention, the battery life of this device is pretty good as well. I did not really notice a difference in battery life in comparison to my other dual 18650 box mods. Honestly, I thought it would have impacted the battery life severely, but I did not notice any less battery life, which is definitely a huge pro! I would get most, if not all day worth of vaping with this device when vaping around 50w to 75w. I did also test the temperature control mode, but only in stainless steel. I do not vape Ni200 or Ti wire anymore, so I did not test this, but by the way the stainless steel temperature control worked, I’m sure those would work just as fine! The temperature control mode for stainless steel is automatically set to SS316, but you can change this in the TCR settings if you wanted SS304 or SS317. You can easily adjust the wattage in TC mode, and whatever wattage and temperature I set it to, it delivered it just fine with no issues. Not to mention, there is a resistance lock feature, which is another huge pro to this device since this is a crucial feature when vaping in temperature control mode! I do want to mention that there is a very slight delay when pressing the fire button when the device screen is off. It seems that the device has to “wake up” and then it will fire right away. Other than that, every time you press the fire button it responds almost immediately. All in all, the performance of the Tesla Touch 150w TC Box Mod was solid! There were literally little to no issues in regards to performance, and it just worked every time I hit the fire button. Even though this device is filled with pros, there are still cons I have to mention, which is what I will go over in the next section! The first con to be mentioned is that there are times when the screen was unresponsive to my touch. Like said before, this did not happen very often, but I still want to mention this as a con since it did happen once in awhile. The second con to be mentioned is that the device does turn off if it is inactive for about 10 minutes or so. I know this can definitely annoy people, and it did annoy me at times. It is not the biggest con, but still have to be mentioned. Another con is that there is a very slight delay when you press the fire button when the screen is off. This only happens then, and afterwards there is little to no delay. Honestly, not the biggest con, but still worth mentioning. The next con to be mentioned is that the fire button is located at the top of the device rather than the side. 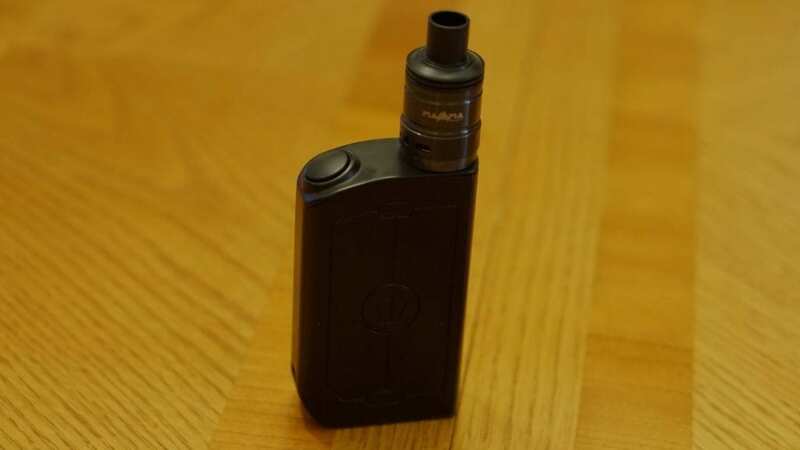 Of course, this is a subjective con, but still worth mentioning as some vapers may not like this and would prefer a fire button on the side of the device. In addition, another con to be mentioned is that you do have to navigate through settings to reach certain features such as temperature control or even adjust the wattage. Even though it is pretty easy and relatively quick to do this, some people may just prefer physical buttons rather than a touch screen to change simple settings like wattage. This is a subjective con as well. Other than these cons listed here, I have yet to experience any other possible issues. Overall, the Tesla Touch 150w is a solid device, and performs well, which leads me to the next section, the conclusion! In conclusion, the Tesla Touch 150w TC Box Mod is a great touch screen device. Touch screen devices aren’t for everyone, and some people may find them gimmicky, but honestly this one works, and it works well. From its simple navigation, to its solid performance, the Tesla Touch is a winner in my opinion. The overall performance of this device in both wattage mode and temperature control mode is excellent. Not to mention, the different power modes will come in handy for any Clapton build you might have in your atomizer! This device is comfortable to hold, and accessing your batteries is quick and easy. Also, the battery cover holds into place firmly, so you don’t have to worry about it coming off randomly during normal usage. There are some cons to it though, such as the device turning off on its own after some time or the touch screen not being as responsive at times, but honestly the device still works perfectly majority of the time. I do think that the touch screen box mods still haven’t reached its full potential yet, but Tesla really made a quality box mod here, and certainly did a good job with its touch screen. This device is firmware upgradeable, so I wouldn’t doubt that there could easily be a fix for the touch screen issue I occurred, which really didn’t happen much. 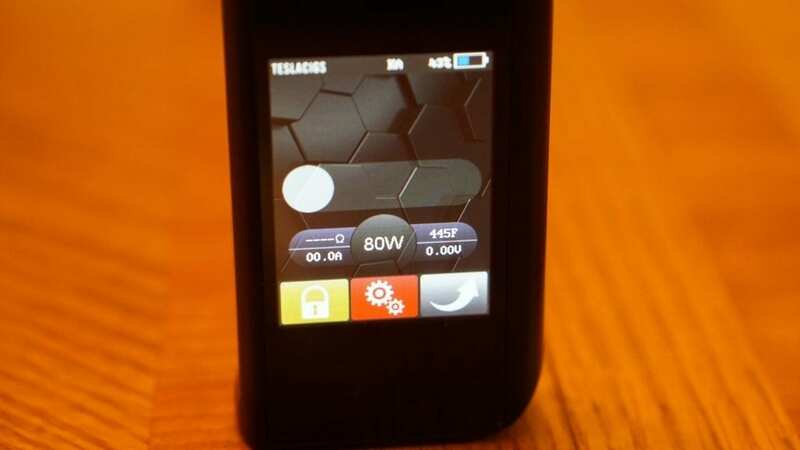 Overall, the Tesla Touch 150w TC Box Mod is a great device, and those looking for a touch screen device that actually works well will certainly enjoy it. However, if you’re not into touch screen devices, and just want physical buttons, then this might not be the right device for you. So if you’re in the market for a touch screen box mod, I highly recommend checking out the Tesla Touch 150w TC Box Mod! I hope this review helps you in finding the perfect device for you! Feel free to leave any questions or comments below! Thanks for reading!